Going zero to sixty in wheeeee. 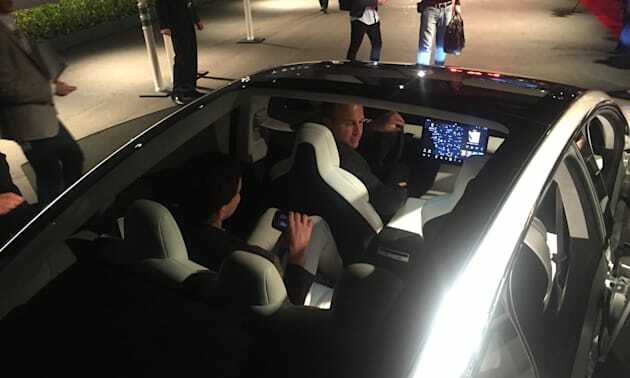 Tesla offered up rides in its news Model 3 to attendees of tonight's event. While the car won't be in the hands of regular folks anytime before the end of 2017 (hopefully), the automaker gave anyone that wanted a ride, a trip up and down the street in a pre-production version of the car. Since I wasn't allowed behind the driver's seat (boo), the entire experience is from that of a passenger. The Model 3 is zippy. Zero to sixty in six seconds is nothing compared to a Model S, but for a family sedan, it's impressive. During the ride, the driver took us up and down a closed street stomping on the gas both times after navigating a disco-light and smoke-machine infused parking lot. The entire drive lasted only a few minutes. 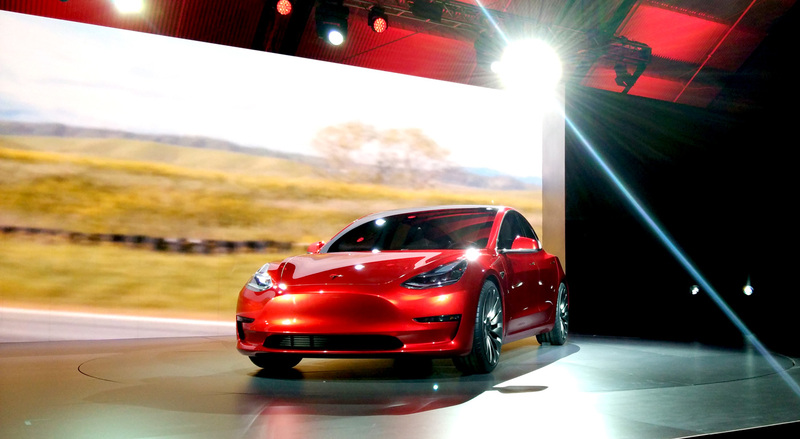 As soon as the cars are production ready, Tesla will probably offer more than a quick jaunt down the street. In the very short time in the car, there were a few things I noticed. 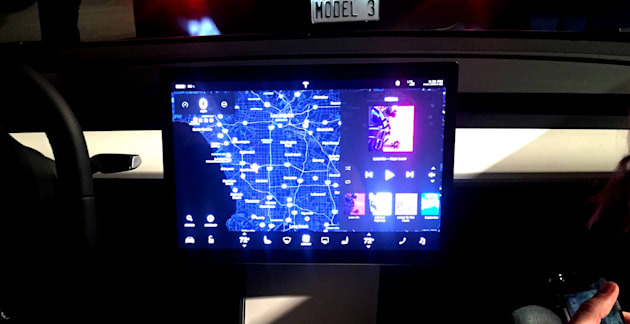 The only display measures just 15-inches horizontal (the Model S has a 17-inch vertically orientated unit) dropped into the center of the dash. That's it. There are no gauges directly in front the driver. The speedometer is in the top left-hand corner of screen. It did seem to be in the driver's field of vision. But hopefully during phase 2 of the car's path to production, Tesla adds a HUD (heads-up display) so the information is directly in front of the person behind the wheel. The only other thing on the screen was a map of the area and media player. I'm sure there will be more information about what will be displayed as the car gets nearer to production. On stage, CEO Elon Musk said the car would fit five passengers. Like most sedans, it's more like four adults and child or very short, petite friend. I saw them cram five journalists in a car, it wasn't something you'd want to recreate on a long drive. Still, since there's no engine under the hood or in the trunk, the automaker was able to move the seats out. At six-foot three inches, I was comfortable in the back seat, which is something I don't get to say very often in a mid-size sedan. One thing that probably helps make the interior feel roomy was the roof. It's entirely glass with a single crossbeam between the front and back seats breaking up the flow. At night, on the open road, it's probably a great way to enjoy the stars. During the day though, especially a hot one, it'll be interesting to see how cool Tesla can keep the car. Also, I hope everyone likes wearing sunglasses. The sleek exterior of the car isn't outlandish. The design, especially the profile is actually more reminiscent of the Model X than the Model S. But whichever Tesla it borrows its looks from might not really matter. 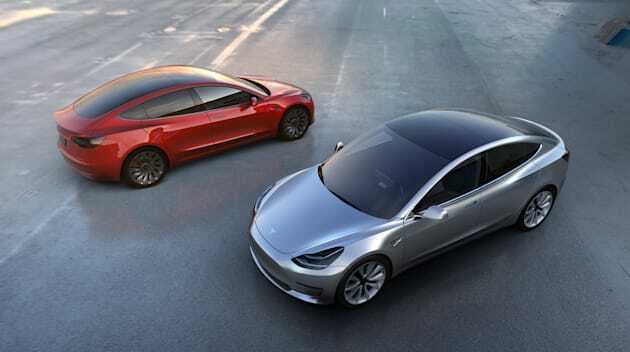 Within an hour of the unveiling, the automaker had already pre-sold north of 130,000 cars to excited Tesla fans. Most of those are folks put down a $1,000 deposit on a car without actually seeing it. They're in for a long wait, but if the prototype that's shuttling people up and down the street in Los Angeles is the base of the upcoming car, they're probably going to be happy with their decision.